In healthy individuals, oral cavity harbors many different spectra of micro-organisms. Among them, Candida species is predominantly observed to be present (in 30-70%). If the human host defense system gets disturbed by diseases or conditions, which alter the immune status, Candida species become virulent and cause candidiasis, which manifests through various clinical forms, involving one or more oral sites and can even disseminate into invasive forms. Furthermore, there is a change in the candidal species from being oral commensals to a pathogen. Identification of Candida species is very important to understand the candidal pathogenicity and the related complications. Taking the above mentioned literature into consideration, the aim of the present study was to assess the candidal colonization and species diversity in the oral cavity of diabetic and nondiabetic denture wearers and its correlation with the presence of Candida on the fingertips of the patients. The study was carried out in the Department of Prosthodontics and Crown and Bridge, Vishwanath Katti Institute of Dental Sciences, Belgaum and Department of Microbilology, Jawaharlal Nehru Medical College, Karantaka Lingayat Education Society University, Belgaum. 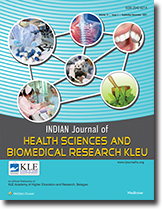 One hundred and twenty subjects in the age group of 40-70 years, attending to the Department of Prosthodontics and Crown and Bridge, KLE Vishwanath Katti Institute of Dental Sciences, Belgaum, were included in the study. Three groups were formed, with 40 subjects (20 males and 20 females) in each group. Edentulous, nondenture wearer, nondiabetic subjects (FBS < 110 mg/dL). The diabetic status of the patients was determined by the history of previous diagnosis of diabetes and their blood glucose levels were also determined before the sample collection using calorimetric method. The denture wearer patients selected were using the dentures since at least 1-year. All dentures were fabricated of heat cure acrylic resin. 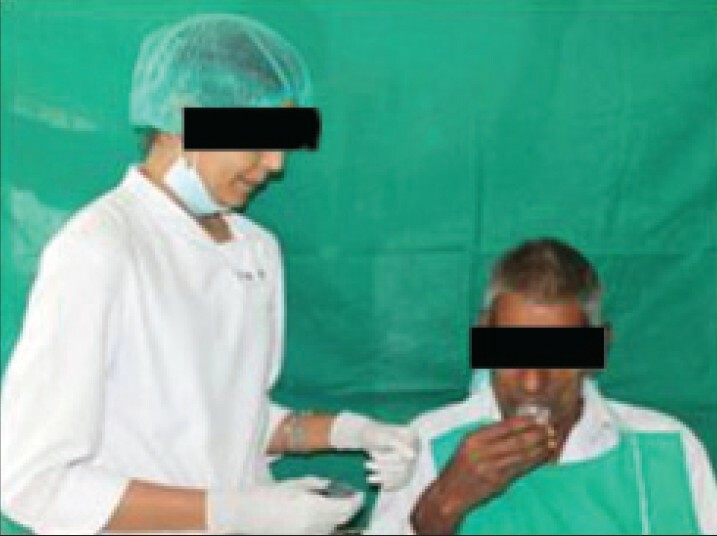 The patients in the control group (Group III) were completely edentulous since 1-month at least and have not worn a denture earlier in their life. All the subjects in three groups were selected from the patients attending the Department of Prosthodontics, Vishwanath Katti Institute of Dental Sciences, KLE University Belgaum. The purpose and objectives of the study were explained to all subjects and the informed consent was also obtained from them in the vernacular language. The study was approved by the ethical committee KLE University, Belgaum. Information on demographics, medical variables, denture handling and denture wearing habits; and hand washing habits after denture handling was obtained using a questionnaire. Patients with history of smoking, any systemic disease, use of broad spectrum antibiotics, Corticosteroid therapy and anti-fungal therapy, antiseptic mouthwashes were excluded from the study. 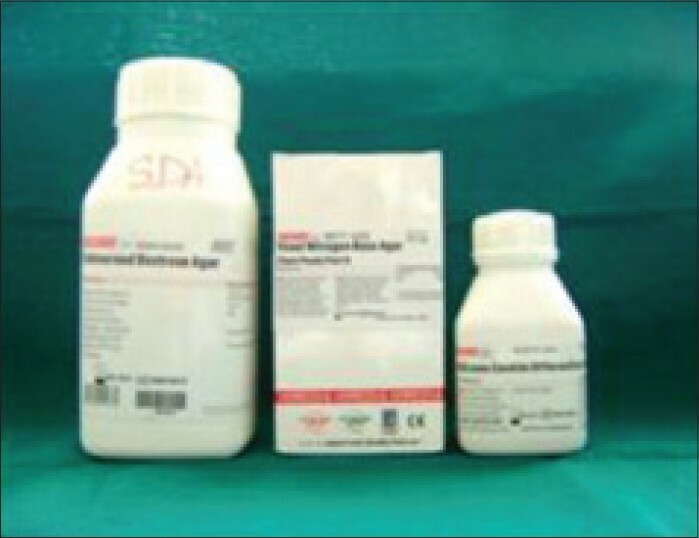 Oral yeast colonization was assessed with the concentrated oral rinse technique as described by Samaranayake et al. Subject was instructed not to eat and drink 2 h prior to the sample collection. 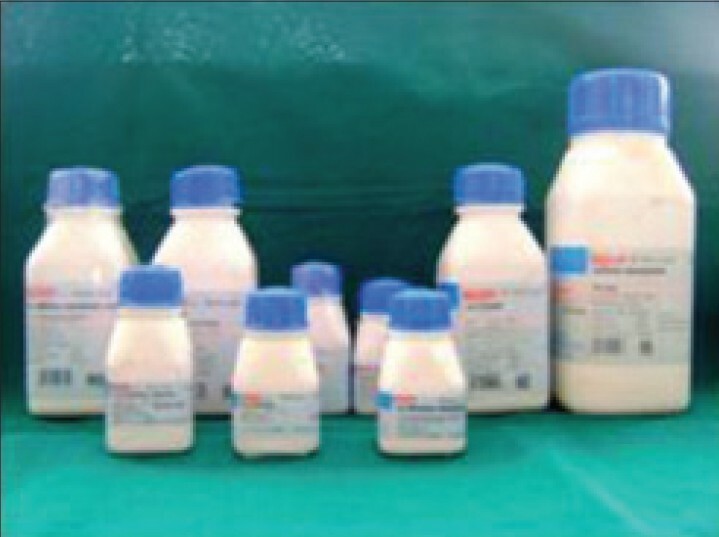 Each individual was given 10 mL of sterile phosphate buffer saline solution (0.1 M solution with7.2 pH) and was asked to rinse mouth for 60 s with this solution. 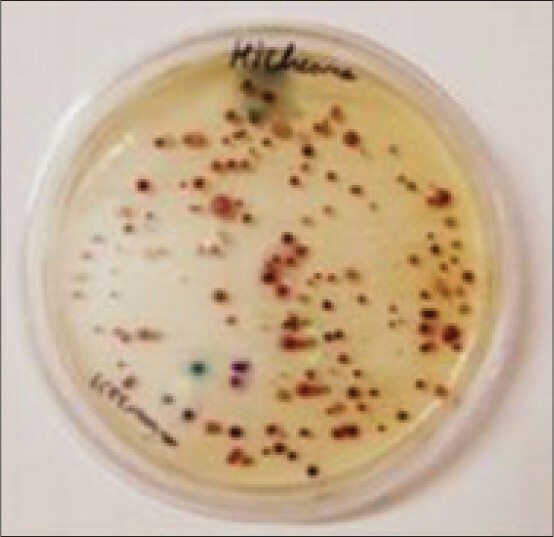 Then that mouth rinse was collected in sterile containers and was sent to the microbiological laboratory [Figure 2]. To prevent the circadian variation, samples were collected between 10 am to 11 am. CFU/mL = 100 × number of colonies. Candida parapsilosis = white, pale pink. 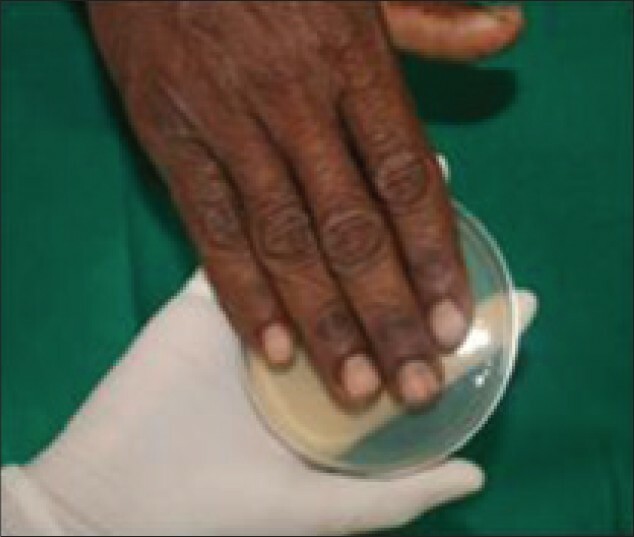 Saboraud dextrose agar plate in which finger tips were pressed, was incubated aerobically for 48 h at 37°C and candidal growth was assessed [Figure 6]. 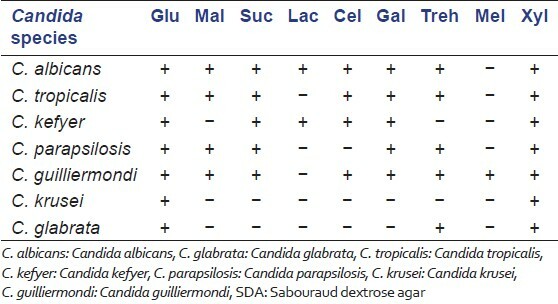 The Candida colony count on SDA varied according to the denture handling habits of the subjects. Of 80 subjects, 63 patients have the habit of handling their denture twice or thrice and 17 subjects handle their denture >3 times. Mean colony count in Group I for patients who handled their denture for 2-3 times and >3 times was 1.20 and 2.40, respectively. For Group II, it was 0.75 and 3.14, respectively. In this study, the number of CFU of Candida is found to be more in diabetic denture wearer subjects when compared to the nondiabetic denture wearer or control group. These results are similar to the few previous studies done evaluating the same factor. According to Daniluk et al. also, the occurrence rate of oral C. albicans in patients with dentures was higher than in patients without dentures (P < 0.05). A study by Lotfi-Kamran et al. also revealed that diabetes mellitus increased the colonization of Candida in denture and mouth. Even the higher colonization of nonalbicans Candida species in diabetic group found in this study is supported by other studies. Martinez et al. isolated Candida species in Type II Diabetics, and found that C. albicans, C. glabrata ad C. kruzei were most commonly present. These species are less susceptible to common anti-fungal drugs than C. albicans. As found in this study, a significant proportion of denture wearer subjects positive for oral Candida also had the Candida colonization on their hands. This suggests that their hands may have been contaminated with yeast during denture handling. However it was found that one subject (nondiabetic, denture wearer, female) had Candida colonization on her finger tips though her oral cavity is found to be free of yeast. This suggests the presence of other sources of contamination. Furthermore, some of the subjects were positive for certain Candida species on the fingertips of their hands, that did not match the oral candidal species. In certain previous studies also, C. cryptohumicolus and C. rugose were isolated from the fingertips, but these species are not the common mycological commensals of the oral cavity. Further studies are required to identify the Candida species to the strain level and to find out the other possible sources of fingertip contamination with a clinical significance. This study results also showed that the patients who handled their denture >3 times a day had higher rate of candidal colonization when compared to the patients who handled their denture 2-3 times/day. This demonstrates an association between the poor oral hygiene and oral and fingertip colonization. The possible role of other means of fingertip contamination rather than the denture handling as in few subjects the fingertip candidal contamination was present even in the absence of oral infection. In few subjects, the species of Candida found on finger tips did not match their oral Candida species. 1. Darwazeh AM, Al-Refai S, Al-Mojaiwel S. Isolation of Candida species from the oral cavity and fingertips of complete denture wearers. J Prosthet Dent 2001;86:420-3. 2. Pereira-Cenci T, Del Bel Cury AA, Crielaard W, Ten Cate JM. Development of Candida-associated denture stomatitis: New insights. J Appl Oral Sci 2008;16:86-94. 3. Lotfi-Kamran MH, Jafari AA, Falah-Tafti A, Tavakoli E, Falahzadeh MH. Candida colonization on the denture of diabetic and non-diabetic patients. Dent Res J (Isfahan) 2009;6:23-7. 4. Samaranayake LP, MacFarlane TW, Lamey PJ, Ferguson MM. A comparison of oral rinse and imprint sampling techniques for the detection of yeast, coliform and Staphylococcus aureus carriage in the oral cavity. J Oral Pathol 1986;15:386-8. 5. Mackie and McCartney Practical Medical Microbiology. Vol. 2. 6. Odds FC, Bernaerts R. CHROMagar Candida, a new differential isolation medium for presumptive identification of clinically important Candida species. J Clin Microbiol 1994;32:1923-9. 7. Larone DH. Medically Important Fungi: A Guide to Identification. 5 th ed. ; 2011. 8. Radford DR, Sweet SP, Challacombe SJ, Walter JD. 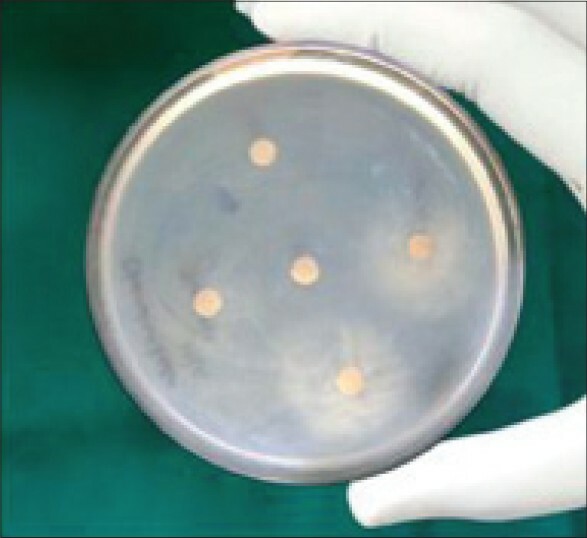 Adherence of Candida albicans to denture-base materials with different surface finishes. J Dent 1998;26:577-83. 9. Beighton D, Ludford R, Clark DT, Brailsford SR, Pankhurst CL, Tinsley GF, et al. 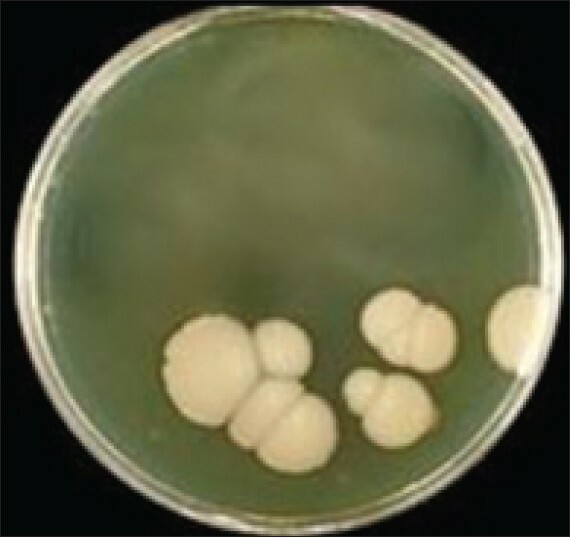 Use of CHROMagar Candida medium for isolation of yeasts from dental samples. J Clin Microbiol 1995;33:3025-7. 10. Daniluk T, Tokajuk G, Stokowska W, Fiedoruk K, Sciepuk M, Zaremba ML, et al. Occurrence rate of oral Candida albicans in denture wearer patients. Adv Med Sci 2006;51 Suppl 1:77-80. 11. Tapper-Jones LM, Aldred MJ, Walker DM, Hayes TM. Candidal infections and populations of Candida albicans in mouths of diabetics. J Clin Pathol 1981;34:706-11. 12. Cristina de Lima D, Nakata GC, Balducci I, Almeida JD. Oral manifestations of diabetes mellitus in complete denture wearers. J Prosthet Dent 2008;99:60-5. 13. Martinez RF, Jaimes-Aveldañez A, Hernández-Pérez F, Arenas R, Miguel GF. Oral Candida spp carriers: Its prevalence in patients with type 2 diabetes mellitus. An Bras Dermatol 2013;88:222-5. 14. McElhaney-Feser GE, Raulli RE, Cihlar RL. Synergy of nitric oxide and azoles against Candida species in vitro. Antimicrob Agents Chemother 1998;42:2342-6. 15. Pellizzaro D, Polyzois G, Machado AL, Giampaolo ET, Sanitá PV, Vergani CE. Effectiveness of mechanical brushing with different denture cleansing agents in reducing in vitro Candida albicans biofilm viability. Braz Dent J 2012;23:547-54.